One of my big focuses as a teacher is giving students tools they can use without me. I've given many students checklists and models that they have later thanked me for as they used them throughout many later classes. Besides those paper tools, I also give my students some electronic tools for reviewing their papers, e-mails, articles and really any written work. None of these are a replacement for a second set of eyes, but it is nice to have technology help out. Below I'll give links and brief descriptions to four sites I give my students. 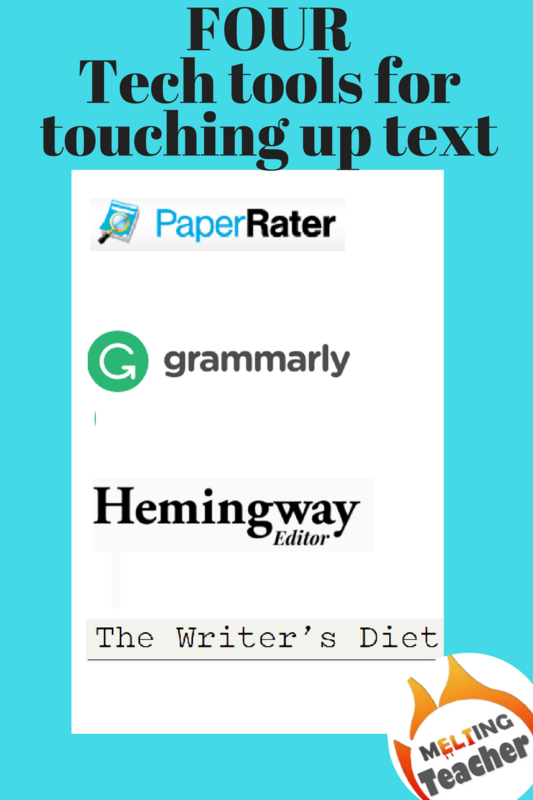 Try them out with your own writing and share them with your students! I bet one or two of them will thank you. If you sign up here you get to try Premium for a week (full disclosure I get a free week if you sign up with this link). Premium is nice, but I find the free version is definitely great too. There's a Grammarly browser add-on (for Chrome, Firefox or Safari), a Microsoft Word add-on, and students can go to the site and copy and paste text to check it. My favorite part though, is the weekly e-mails students get. 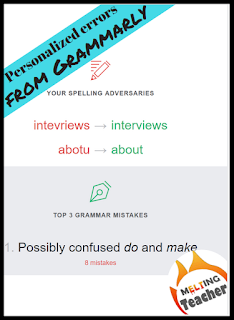 Grammarly sends an e-mail once a week that lays out spelling and grammar issues they encounter most often. Students can combine this with NoRedInk and practice any grammar skills they still struggle with on their own. This site does have a lot of ads, but it's a great time to teach some digital citizenship in being careful what you click on. 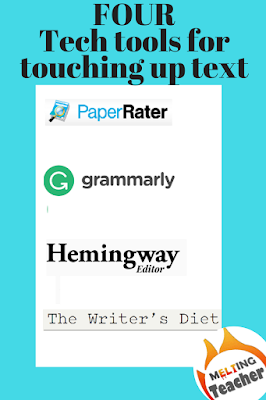 Students copy their text and then go to PaperRater. Once there, they paste their text into PaperRater filling out their specifics (type of text, grade level, etc.). The site looks at several different elements: Spelling, Grammar, Word Choice, Style, Vocabulary and Words. Then it gives a grade. Obviously, this isn't perfect! For style it looks a lot at transitional phrases. For Word Choice it basically identifies words like "a lot, I don't, big, don't, get, really, many, am, go, most" and reminds students to consider other words or use a thesaurus. A big thing to go over with students is that the grade is automated and that it definitely isn't a crystal ball that will predict that grade they earn. 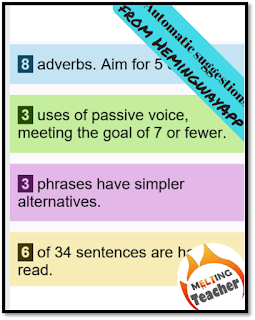 Reminding students that bigger isn't always better, Hemingway looks at sentence length, adverb usage, passive voice, and just awkward phrases to make writing easier to read. 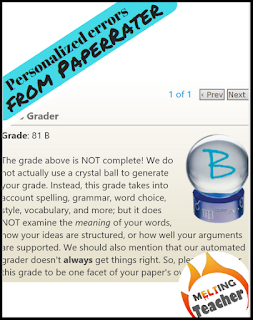 While PaperRater also looks at sentence structure, most students get focused on the spelling, grammar, and grade. Hemingway focuses exclusively on structure. Spelling and grammar errors are irrelevant. Hemingway Editor is definitely a site worth introducing to students. 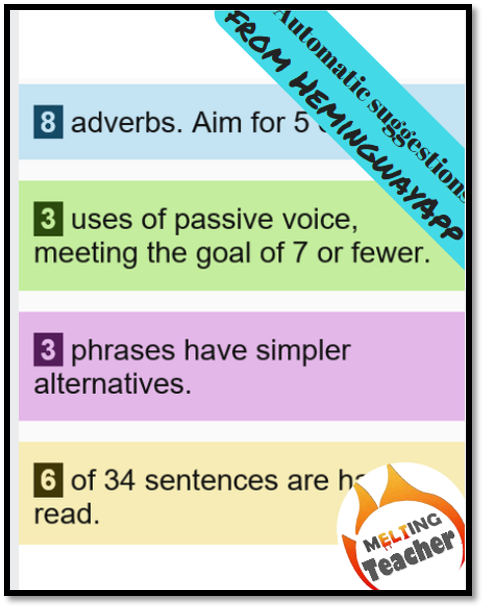 There is a time and a place for adverbs, passive voice and complex sentences, but this site's easy color coding can help students see if they have too many of one color populating their essay. Last but not least, there's The Writer's Diet. 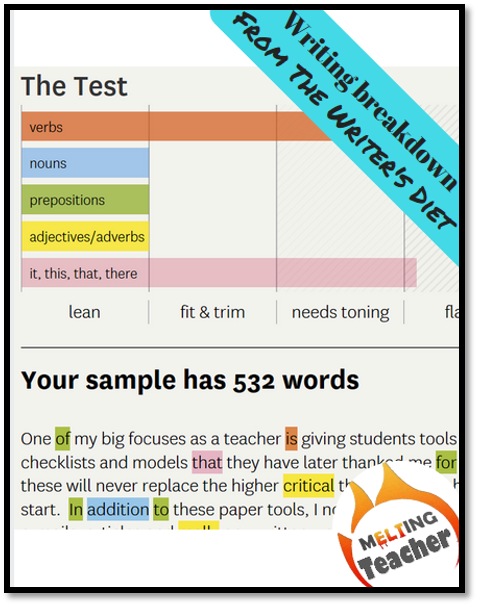 Based on the book by the same name, the site encourages writers to have "fit" writing rather than "flabby" writing. After copying and pasting a text, students' are given a bar chart detailing a breakdown of their text and then the text itself. There you are! Four more digital tools that students can store in their toolbox. I am always sure to discuss all of these with my students. In fact often when first introducing them I have them run their text through and make changes. Then they give me a little write-up which site they used, what was helpful, and what was not so helpful. This helps build a critical eye and students get an idea of when to use which site. These are meant to be helpful tools, but they should be used with a critical eye. These are all automated and none of them perfect! Do you know of any others I should add to my list? Have any experience you'd like to share? Let me know in the comments! Great post. I am a college student and I use PaperRater on all of my papers. I also share it with my students. I have wanted to try Hemingway Editor. Thanks for the new ideas.